Khukuri House Thamel now into its 13 years in business has gathered enough experience and knowledge inch by inch, from the tip of a kukri to the end of a blade. 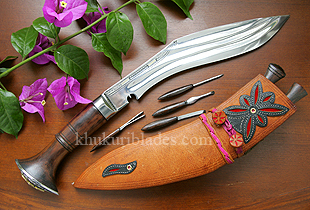 Now utilizing it, Khukuri house Thamel has designed these new kukris with new better effective shapes, new improved handles, superior blades, better balanced, higher finishing but always making them the traditional way. Try out these new products and feel the difference. Chitlange, the newer version of Chainpure with better feel and looks, Kukri Cowboy and Panawal Gripper for longer reach, better strenght, better grip and durability, Angkhola Supreme with bloster for safety guard and many more new Kukris to come. This new Ganjawal Plus comes with a better looking color leather, specially crafted blade and a unique detailed metal cap at the end of handle. A master piece.